I get no special thrill reading The Prince. The practical advice is practical and the Italian history lessons are largely characters lost to history. And though I eventually pursued a second major in philosophy, I eschewed political philosophy in the end (philosophy of the mind!). Like The Prince I think I found it too boringly practical. Reading now as an adult I also think Machiavelli was prone to huge swaths of generalization that are safe to occupy if you are dealing in the purely hypothetical. Especially passages like the one that exhort the prince to be miserly instead of generous (because generosity will likely bankrupt you) or the one photographed below, which lists a series of negative and positive adjectives as relate to princes. I was more engaged by political thought as a teenager. I wanted to change the world, change the whole damn world, and I just assumed that was only a handful of manifestos away in the future. 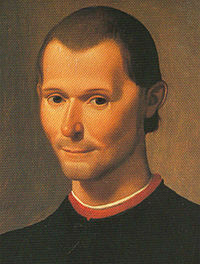 I see the influence of Machiavelli’s realism in a scheme I concocted at 16 for the formation of a world republic. Vigorously procrastinating some calculus homework, I hand-wrote about fifteen pages of a plan. I left aside the core question of whether or not all countries would accede to the republican model (ah, to be a young American with it all figured out), but I did guess that the worlds’ government would not cede their power to one another easily, so I proposed only a weak global confederation. We all know from disaster movies (surely this was after the release of Independence Day) that the world’s nations will only put aside their differences in face of an external crisis. So sans alien invasion, how could a good crisis be created? All of our uniting external crises in history had just been other groups of humans. How to break down Us vs. Them to completely eliminate Them? The idea was in the weakness of the Confederation. The collapse of the Confederation would be the crisis that would then unite the nation-states. Sounds naive? Well it should also sound like senior year AP US History, as the model was the American Articles of Confederation. Pretty boringly cynical for a wild-eyed idealistic high schooler. Thanks a lot, Machiavelli. Buy the book and read more about this joker’s advice for how you should denude the powerful nobles in your province. This entry was posted in Books on May 26, 2014 by magicandrew.